In class the other day we got into a discussion of the representation of animals, specifically for anthropomorphic purposes. There was a period in the late 19th century and early 20th when animal characterizations tended to rely on relatively faithful representations, adjusted for narrative purposes: quadrupeds become bipeds, and are outfitted with clothing. The development of cartoon vocabularies followed. The pathway from Brer Rabbit to Peter Rabbit to Bugs Bunny is a discussion for another day, in another format. But suffice to say, an intriguing arc, partly explained by the volume of production drawing required for animation. A case study, for now: "Precocious Piggy," written by Thomas Hood, an English poet, and illustrated by his son, Tom Hood. The younger Hood wrote more than he drew, and edited the English magazine Fun in the 1860s. These illustrations probably date to 1870. They appear in a disintegrating book from my grandparents library, The Merry Maker, Volume II in The Young Folks Library in Twenty Volumes. This volume was edited by none other than Joel Chandler Harris, he the writer and "slave folklorist" of the Uncle Remus stories–which, at the time of this publication, were twenty years old. And fantastically successful. 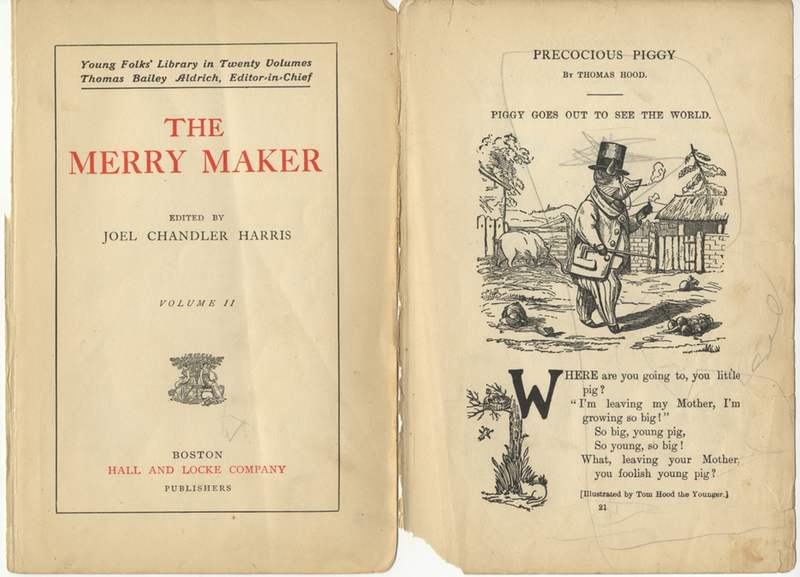 An anthology, The Merry Maker was issued in 1902 by Hall and Locke, Boston. Precocious Piggy was included, one of the few substantially illustrated entries in the volume. In response to queries posed by the narrator, Piggy declares his intention to engage in a series of activities, all of which turn on rhymes with "pig." Piggy goes a-drinking, and offers us a boozy wink. Alas, the story does not end well for Piggy. The butcher shows up, though perhaps his partial presence on this torn page offers our frantic hog a reprieve. Hop the twig seems like a stretch for a rhyme. Perhaps it's a now-obscure British idiom. What does it mean? Is it a variation on "walk the plank," from pirate stories? (I checked on the dating of the phrase, since it could have been an anachronism. Walk the plank first appears in a reference work in 1788.) Or does it refer to the skewer on which the poor fellow may soon be roasted? These may not be the most distinguished drawings of their kind, but they're pretty darn good. The spot illustrations associated with the inital cap Ws have wit, though this one gets a little clogged up between the figures on the left. Have a lovely weekend, and steer clear of the butcher!